After avoiding the issue for the longest time, Irecently bought the Grizzly G0440 dust collector. It will be thecenter piece of the new dust collection system in my shop. I havebeen working without dust collection for over a year now. I regretnot getting a dust collector immediately when I started my shop.Like so many beginners I decided to invest in machines first. Thedust got so bad I did not want to work in the shop anymore. 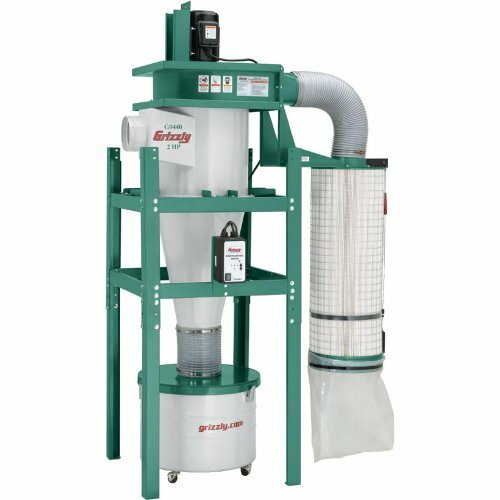 Dust collectors eliminate dust at the point it is produced. The collector is the first line of defense against airborn dust. It will collect well over 90% of the dust right at its origin. Protable collectors are a good choice for the hobbyist. They do not require ridgid piping to be installed, and can be moved where they are needed. In production shops, however, a portable unit will quickly become cumbersome. Dedicated stationary units are the better choice. Cyclonic collectors are far superior machines compared to bag-type collectors. The cyclonic action pulls most dust out of the air before it reaches the filters. The time between filter cleanings is reduced, and much finer filters can be installed. Bag type units are not without use. They operate well enough in most cases. Portable collectors move from one tool to the next. They provide good performance due to the short distance from the tool to the collector. The drawback of portable collectors is having to manage the hose. Stationary dust collectors are the centerpiece of a dust management system. A central collector is connected to several tools with ridgid piping. Blast gates control the air flow. It takes a surprisingly large amount of air to do a good job of collecting dust efficiently. As a general rule, it takes all the power you can draw from a single 115V outlet to power a collector strong enough to service a tablesaw with little piping installed between the collector and the machine. Portable dust collectors should be sized at 115V max (~1.5HP). Anything less and the machine is making comprises on peformance. If you plan on having any amount of piping, a larger stationary machine is the better choice. Collectors with cloth bags for filters do not filter the air as thoroughly as collectors with paper filters do. Every woodworker has to decide for themselves what level of filtering is good enough for their shop. "The G0440 is a great cyclone that will last a decade. Solid metal all-around, a great filter, and a well-balanced fan. A great value."